You can always count on us to: focus on the long-term, maintain diligent oversight, be there when you need us and act in your best interest. Welcome to Hochman Cole. We believe that no two clients are exactly the same in terms of their investment goals or financial challenges. Each one of our portfolios ends up reflecting the individual client and is specific to his or her needs. 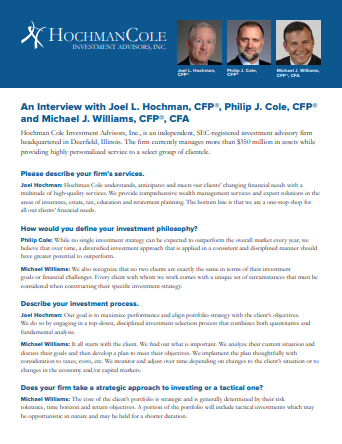 Hochman Cole Investment Advisors is a fee-based SEC registered investment advisory firm specializing in retirement planning for individuals and small businesses. As a boutique investment advisory firm, we offer service that is personal, private and exclusive. We aspire to have only a limited number of clients, but to provide personal service and attention to each one of them. We take the time to understand your investment goals and how you feel about your money. We will examine where you are financially today versus where you want to be in the future, and then we will create a detailed investment plan to get you there. Your portfolio is monitored and you receive reports quarterly about performance. We offer a complimentary “Get Acquainted” meeting to see if we are the right fit for you.